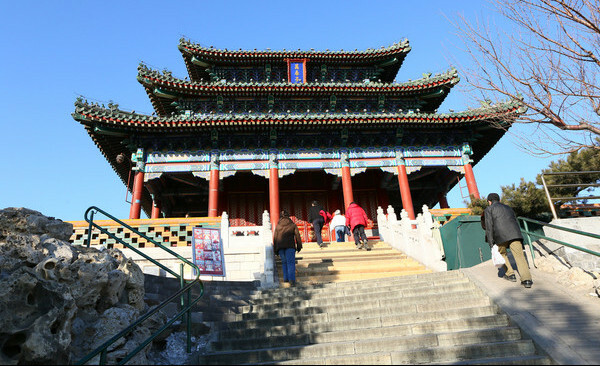 Jingshan Park is located to the north gate of the Forbidden City. 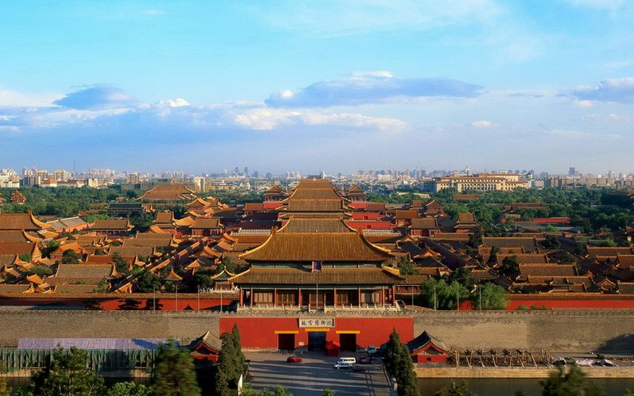 It was once part of the Forbidden City until 1900s. You can enjoy a bird’s eye view of the Forbidden City from the Pavilion of Everlasting Spring (Wanchun Pavilion), piles of golden roofs stretching into the distance. The 45.7-metre high artificial hill was constructed in the Yongle era of the Ming Dynasty entirely from the soil excavated in forming the moats of the Imperial Palace and nearby canals. It is especially impressive when one considers that all of this material was moved only by manual labor and animal power. Jingshan consists of five individual peaks, and on the top of each peak there lies an elaborate pavilion. These pavilions were used by officials for gathering and leisure purposes. These five peaks also draws the approximate historical axis of central Beijing.